The Five Ten Access Knit approach shoes are a stylish super breathable cross over between casual kicks and performance approach shoes. I’ve been testing a pair on trails and climbs for two months now and will share my impressions in this review. First the manufacturer details and specifications. I went with a US Men’s size 9 (EUR 42) and the fit is pretty generous for my medium width feet with slight Morton’s toe. At first “try on” they feel pretty similar to the fit of a pair of NRS Water Shoes. There is definitely enough width for these to be an option for folks looking for a wider fit. Narrow feet might need to size down or risky sliding around a bit. The heel cup is well sized with a rubberized stiffener providing a secure hold. The toe box is also generous with plenty of wiggle room. 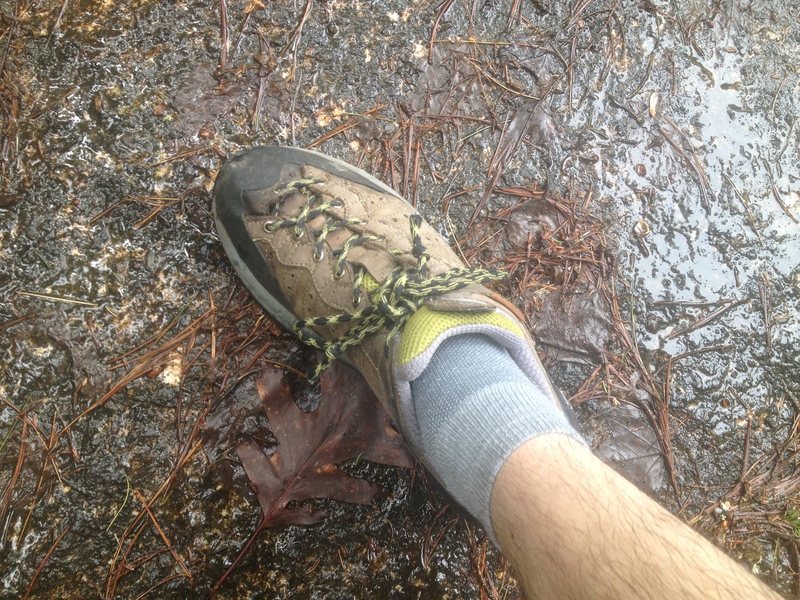 I’ve worn these both with and without socks and had no discomfort after 8+ mile hikes. These are pretty ideal for long distance comfort, especially in hot weather. My feet are notoriously warm and sweaty and probably the greatest strength of this model is the high breathability due to the almost all knit upper. The EVA Midsole is thick and provides plenty of cushion on the most demanding descents. They are not waterproof but do dry very quickly when you mis-step while rock hopping over that stream. Most hikers will be overly impressed with the performance of the dot pattern Stealth® PH™ non-marking outsole when it comes to walking up wet slabby rock but miss a more aggressive lug pattern in muddy or very soft trail conditions. The torsional rigidity falls in the middle of the spectrum, offering more rigidity and support than the softer LaSportiva TX2 but not as stable platform as the Five Ten Camp Four. The lacing unfortunately does not extend further down the toe so you can’t really snug them up for a “performance lace”. In fact lacing them too tight led to some uncomfortable pressure on the top of the foot as the model does not really have any padding in the seamless tongue (similar to a neoprene wet shoe). Overall these are quite comfy on flat and moderate trails. The casual fit is most noticed on steep descents where the lack of form in the upper is noticed as the foot moves around a bit in these moments. Legendary Five Ten Stealth Rubber Outsoles! To test their climbing ability I took a lap up Upper Refuse (5.6) on Cathedral Ledge and Sea of Holes (5.7) on Whitehorse Ledge. As expected they smear great with that legendary Stealth rubber! Edging performance was a bit lacking due to the very rounded edges on the toe portion of the outsole. There is a heel loop for clipping them to your harness when it’s time to switch to actual rock climbing shoes and the knit upper is quite crushable for storing in a small pack though the heel stiffener that provides a nice hold on the heel resists crushing so they will take up a little more room than the LaSportiva TX2, but much less room then the Five Ten Camp Four. I did not test them much in cracks as I think it’s obvious the knit upper would take a real beating if they were used in such a manner. Overall these climb “ok” but I would stick with models like the Five Ten Guide Tennie or LaSportiva TX4 for more serious technical climbing. This new model is an interesting addition to the Five Ten line. If thought of as a casual lifestyle type shoe that can handle a mellow or moderate approach they fit the bill. People with hot feet who don’t mind trading a little overall support for awesome breathability should take a look at these. Hikers and climbers with wide feet may find this model to live up to its “sock like fit”. Disclosure: The product links provided in this post are affiliate links. Purchases made using these affiliate links go to support the content created here at Northeast Alpine Start at no additional cost to you. Thank you for your support! I bought my first pair of Five Ten Camp Four Approach Shoes in 2009. Over the last 4 years I have worn them on hundreds of miles of White Mountain trails, dozens of guided trips, and quite a few search & rescues. They have served me so well that when I finally wore them out I had no doubt that I would be replacing them with the same shoe. They are the perfect 3 season supportive hiking shoe for a number of reasons. I only wear boots when their is snow & ice on the ground, so from April to November these are my most worn shoe for hiking in the Whites. It’s important to note even when carrying a heavy pack I don’t need the ankle support that some folks do, so if you question the strength of your ankles you might prefer something with ankle support. However these do offer excellent support for your foot from a full length nylon shank and comfortable EVA mid-sole. This under-foot support is a big difference from my softer Five Ten Guide Tennies, which I prefer for moderate rock climbing, but are to fatiguing when covering many miles of rugged terrain. The Stealth C4/S1 high-friction soles provide amazing friction on wet & dry rock. This is also probably the beefiest sole I have seen on a trail shoe which is probably why these weigh in a bit heavier than similar trail shoes at 1lb 12 ounces, but I’ll take a few extra ounces for the great durability and support this out-sole provides! I’ve put a few 12+ mile days on these, much above tree-line, and they are the only trail shoe I’ve put so much abuse on that I haven’t wanted to take off the second I get back to the car. They are that comfortable. The only con I can think of is they are not waterproof. No biggie there, since they are made with Nubuck leather I would waterproof them myself with Nikwax Waterproof Wax every other year or so. Bottom-line: I hope they never stop making this shoe. I plan on finishing the 48 four-thousand footers with these, and continuing my red-lining of the WMNF. I think these would be the PERFECT AT Thru-Hike shoe, though I imagine it might take 2 pairs to complete the 2,100mi trip. Check em’ out!